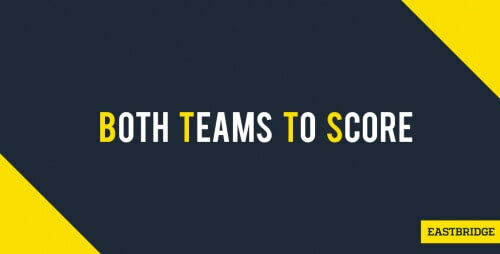 Both Teams to Score betting, or simply BTTS, is one of the most extremely popular markets wherein the punter will simply bet on whether both teams in a match will net a goal or not. BTTS is virtually exclusive to football, as the sport allows goalless matches for at least one of the teams. Within five seasons of the biggest leagues of European football, for instance, a mere 51% of matches that concluded have both teams scored at least one goal. The remaining 49% accounts for matches with both teams not scoring any goal, as well as games with only one of the teams scored at least once or more. Why is BTTS so popular? BTTS betting started as an alternative to betting markets that leaves punters to more than two choices – will the match turn out to be a home win, an away win, or a draw? BTTS, on the other hand, simplifies betting into a binary selection. The function of BTTS as an alternative to other markets becomes prominent in cases when there is no clear favourite in matches. Back in November 2015, for example, when West Ham and Everton met at the Boleyn Ground, bookies made similar prices to all three possible outcomes for the match. In such cases, BTTS betting could be initially used by the careful punter. BTTS betting is very simple and one only needs less than three minutes to learn it, which also explains its overwhelming popularity. The entire process of BTTS betting is just like a bookie asking a simple question that goes “Will both teams score?,” and the punter only has to literally answer ‘YES’ or ‘NO’ by placing bets on either of the two. Betting on the YES signifies that he or she believes that both of the teams will score in the game at least once, while placing the bet on the NO means an anticipation of a match wherein none or only one of the teams will net a goal. Betting Markets: Asian Handicap. Over / Under. In BTTS, betting YES will give one a win if the tally goes 1-1, 1-2, 2-2, 3-2, and so on. Either way, the bettor wins if he or she selected NO with a match resulting to a 0-0, 0-1, 2-0, 3-0, and so on. One of the advantages of BTTS is the punter could lose or win a bet even before a match had concluded. If, during the match, both of the teams already netted a goal, those who bet on the YES are already winners, while otherwise for those who chose NO. One of the interesting features of BTTS is one needs to use his or her own creativity in able to predict the outcome of a match. Gone are the days when people are left to decide which team will win or lose. In this game, the punter is left with a more exciting way to bet. Due to the binary nature of Both Teams to Score betting, one is given the impression that the bettor is left with almost or over 50% chance of winning and likewise to losing. The chances are, however, subject to change, especially when the record of both teams showed if they would most likely score or not. You could refer to statistics in able to win in BTTS, but the point of this market is for people to make more creative decisions in betting. Take England and USA for example. Tables shows that in matches between the two teams, England would most likely score. Now, the bettor has to predict whether USA will net a goal or not, since tables had showed that the team usually end the matches goalless, but one still can’t be quite sure whether they will hit it this time of not. Sometimes, it is important for punters to unwind and enjoy the game while still doing the thing they love, and Both Team to Score betting is surely the market for them. So, is it a YES or a NO? Subscribe to Eastbridge bet brokerage for more articles that would give you a hand in betting. Want to explore more betting markets? You could sign up in our partner trading platform VOdds for easy access to Asian sportsbooks.